This one goes out to all my IT homies. Dell PE6800, Quad Processor Dual Core w/Hyperthreading running Win2003-R2 Enterprise. Windows sees all that processor goodness as 16 separate processors. The onboard 26GB of RAM and 3TB of local storage round out this sweet server. Price ? $25k-ish. 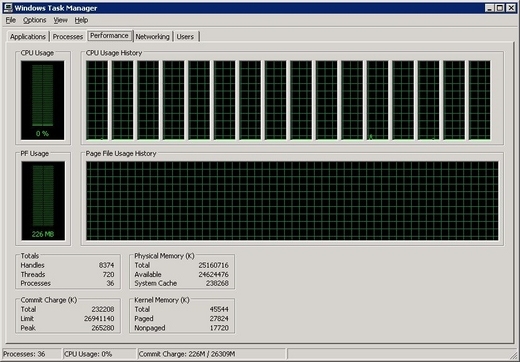 It's going to be a kickass SQL server machine. We asked him to send us a picture of it loaded. Since it was a preproduction server, he had to run some apps. Namely, "defrag, scandisk /f, virus scan on all fixed disks, and finally a five minute CPU stress/reliability test" Click to the jump to see how the monster fared.